You can use strength training moves with resistance bands, which will give you a whole new spectrum of feelings.For instance, use them when you do your squats or hip thrusts. Your muscles quickly adapt to movements you do often, which is why adding variety to your workouts is key for challenging your muscles. I have noticed that ever since I start my glutes workout with 2 or 3 sets of warming up with a resistance band, when I do any leg exercises after, I feel my glutes even more and can squeeze those muscle even harder. Yes, you can lift super heavy but you need to get that metabolic stress as well. And a good way to achieve it is finishing up your heavy load rep with a resistance band. 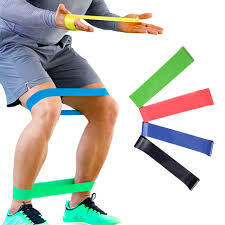 If you going away for a vacation you have a great opportunity to challenge your body with a bunch of new body weight exercises using any type of resistance bands. They are small any can fit in your baggage with ease. No gym is required if you have variety of different bands. With that being said no excuses my dear friends. Summer is a great time to look your best. Level up your fitness! Look your best! Contact JULIA DARS today!